The tragic 2012 theater shootings in Aurora, Colorado, provides a wealth of lessons learned for first responders, and Lt. Sam McGhee is fusing his experience with his master’s degree education in amplifying those lessons for homeland security professionals across the county. 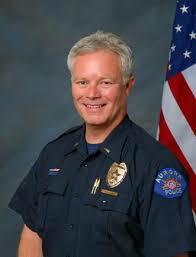 Aurora (Colorado) Police Lt. Sam McGhee. His message has come, to name a few, in the form of an article for The Police Chief magazine, “The Aurora Theater Shooting Experience: Considerations for Multi-Jurisdictional/Multi-Disciplinary Response to Mass Shooting Events,” this past summer, participating at this year’s National Homeland Security Conference as a featured speaker discussing the lessons learned in Aurora, as well as returning to CHDS to lecture alongside fellow alumni discussing important aspects of crisis decision making. A central message is the importance of pre-event planning among various agencies located in proximity to one another. In the case of Aurora, it is part of a 10-county North Central Homeland Security Region of Colorado as well as Denver’s Urban Area Security Initiative, an area that covers city and county governments along with state and federal assets. The Region has identified and filled preparedness gaps as well as conducted various inter-agency exercises such as a 2009 active shooter scenario with Buckley Air Force Base that involved 40 agencies and 200 volunteers. The seeds of this multi-agency partnership are rooted in the 2008 Democratic National Convention that was held in neighboring Denver. Preparations mandated solidifying agreements among agencies in the region beyond usual day-to-day mutual aid agreements. “Not that we weren’t cooperating before but this took it to a new level where we needed to indemnify officers that were going to be working in the city of Denver, make sure everyone was trained on same crowd management philosophy and tactics, and that everybody was equipped the same,” McGhee noted. Pre-existing bonds proved critical on July 20, 2012, when a gunman armed with a shotgun, a pistol and an assault style rifle fired upon movie-goers at a Century 16 theater. Not only were there dead and wounded on the scene, but investigators soon learned of the culprit’s apartment which was found to be rigged with incendiary devices that had to be defused. “The pre-incident planning efforts made calling on area partners from the multitude of first responder agencies in other jurisdictions, non-governmental agencies, and numerous other levels of assistance much easier,” McGhee wrote in The Police Chief article. Another important take-away from the theater shooting is the important value of crisis decision making, he added. Not every needed action can be found in a manual. Early during the response a 911 dispatcher made a crisis decision and issued an all-hands metro-area broadcast on the state-wide radio system, the first and only time that has occurred. Police officers at the chaotic scene are also credited with saving lives as they transported 27 victims in patrol cars to area hospitals as first responders were besieged by the overwhelming numbers of critically wounded. McGhee plans to write a future article on the importance of crisis decision making. This comes on top of a piece in the August/September 2016 edition of Homeland Security Today magazine examining the emerging challenges facing law enforcement in the U.S. Continuing his research and writing is a way to give back to the CHDS program, he said, and the master’s degree curriculum honed his skills and crafting his message. McGhee shares the lone status of having completed two of the Center’s programs as well – Executive Leaders Program, Fusion Center Leaders Program.